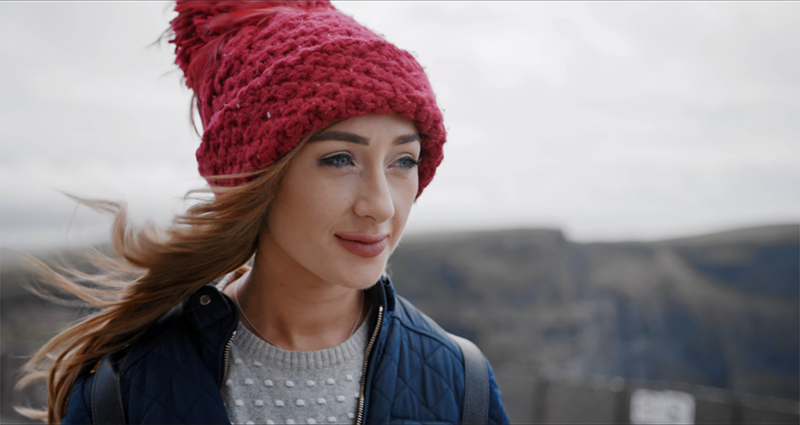 A NEW production company in East Clare is making waves on the media circuit. Having already featured on The Saturday Night Show, the father and son outfit even had to turn down an appearance on The Late Late Show. Fionnathan Productions is a not-for-profit collaboration between 17-year-old Fionn Crombie Angus and his father, Jonathan Angus, from Mountshannon. Fionn has a passion for filming, music, nature and a love for life. Over the last year the teenager, who has Down Syndrome, has been exploring his passions on video, as well as filming what others are passionate about. “We’ve been making videos for a couple of years just for fun. This summer the Tour de Munster was coming through and because they give their money to Down Syndrome, we wanted to do something. So we thought, let’s make a video. We talked about interviewing people around County Clare with Down Syndrome but Fionn came up with the brilliant question, ‘what do you love about your life’. We asked people this and whatever the answer was, we filmed people doing that thing,” he outlined. The duo has captured people surfing, driving and greyhound racing, as well as playing with their pets, baking, playing music and dancing. Fionn said, “It is fun to film things. I also love wildlife and want to film wild animals in the future”. The first project took a month to complete and was shown in the Lakeside Hotel in Killaloe to upwards of 150 people. “It was well received but we realised what do you love about your life is not only a question for someone with Down Syndrome, it is a question for everybody,” Jonathan continued. They then began to work on the second project, which led to interviews with headline acts at this year’s Scariff Harbour Festival, Ryan Sheridan and Damien Dempsey, as well as Martin Hayes, Conor Newman, the chairman of the Heritage Council of Ireland, cyclist Sean Kelly and filmmaker Doug Allan. Fionn and Jonathan’s idea sparked national interest and they were featured recently on The Saturday Night Show with Brendan O’Connor. They were in big demand, as they were also asked to appear on The Late Late Show but had to decline. “We had to explain that we were already booked. There aren’t many people who can say ‘we turned down The Late Late Show’,” Jonathan said. Jonathan said he was “so proud” of Fionn. “I was most thrilled that he wasn’t so nervous that he wasn’t able to be himself or show his humour and his witty personality,” he said. 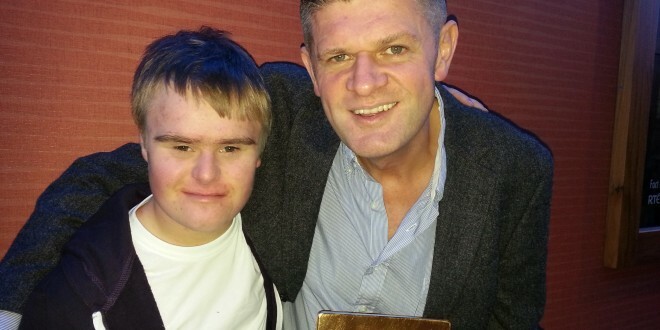 After the programme, Fionn presented Brendan O’Connor with a golden tablet he made with a drawing of the Minator. There is another exciting prospect for Fionn, who is in his final year at Scariff Community College, as Jonathan explains. In addition to this, Jonathan contacted the Heritage Council enquiring about Fionn becoming a heritage council expert on the back of his presentations. “I told them the unusual thing is my son is young and then I said as a by the way, he has Down Syndrome. They were quite open and encouraged us to apply and he got an invitation to interview with them. So it is looking promising. He might become the youngest heritage council expert,” Jonathan said. Asked what he thinks of this opportunity, Fionn said, “It is kind of a scary thought. I’d feel grateful and honoured” but added he loves going to primary schools and teaching the pupils what he knows. For more information, visit www.fionnathan.com or see their Facebook page.